The Burton Story Board is a really strong one board quiver for directional riders that love to turn on groomers but also want something very competent in powder. It’s not the best for harder conditions but if you ride when it’s mostly medium to soft this really shows it’s strengths. Conditions: some good conditions but a lot of areas that were pretty hard. We try to get as many images of the Burton Story Board, but forgive us if they're not all there. I have been riding a Lib Tech Attack Banana as my daily driver for the last few seasons and while it charged hard and pushed my riding, I had a hard time taming that board - working hard for turns and buttering was next to impossible. 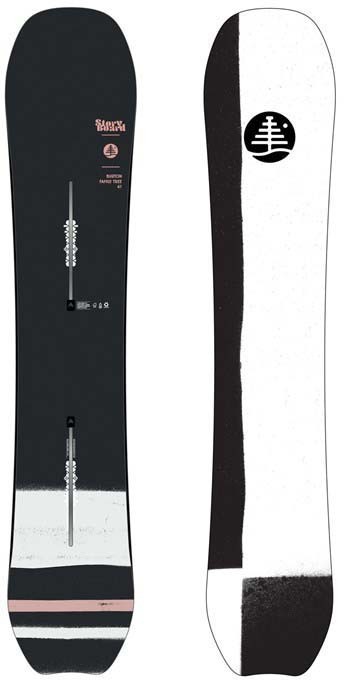 I ordered Burton's Storyboard (152) and was a tad concerned about the stiffness rating and other reviews saying you had to really work to stay on top of this board but after riding the Lib Tech I found this board super responsive and buttery through turns - the torsional flex gives me so much control but its also stiff enough that I feel stable and confident riding big lines at speed. I was also concerned about the board's directional shape - I live in Revelstoke and you can end up traversing a lot so being able to ride switch is important. Sure, it is not the best freestyle board but I have no problem riding this board switch (I ride it centerish) - on groomers and cat tracks it rides like a twin; so I feel like the description as a 'directional' board to be a little misleading. The board also has really good pop - I was used to really charging up my legs going off features so the first time I hit a booter on this board I accidentally sent it into oblivion. I can't tell ya'll how much I love this board - definitely worth the investment!